Stream restoration specialists, Seth Coffman and James Fulcher, from Trout Unlimited take elevation and survey measurements to develop a targeted restoration plan for the stream below Millwood at Carter Hall. Tall vertical banks contribute a tremendous amount of sediment to Spout Run and the restoration plan will ease the height and slope in targeted locations. Plantings will also help to stabilize the ground to minimize soil erosion. The Spring weather cooperated last weekend as Gem Bingol of the Piedmont Environmental Council (PEC) led the streamside segment of her certification course in benthic macroinvertebrate testing. A certification exam was administer at the conclusion of the class. The C Spout Run partnership has been recruiting volunteers to help monitor the health of our streams by checking the numbers and types of aquatic species that live in them. These certified volunteers will help gauge the effectiveness of efforts to bring back the watershed by sampling the animal life at various points several times a year. Congratulations and thank you to our new class of certified volunteers. We look forward to sharing baseline and ongoing testing data with the Spout Run community as this project progresses. 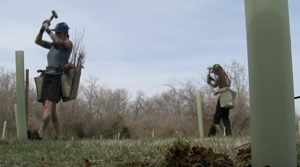 The Virginia Department of Forestry receives grant funds from U.S. Forest Service Region-8 for the purchase and planting of tree seedlings in impaired watersheds. The grant, called “Trees for TMDL”, is distributed by the Virginia Department of Forestry to partners looking to install riparian buffers. Clarke County was the recipient of a generous gift of $2,000. These funds were used to plant over 200 seedlings in the Spout Run watershed at Boyce Elementary School, Powhatan School, and the Burwell Morgan Mill. Conservation Services, Inc. performed the planting. Date: Rescheduled for April 13 at 1:00 p.m. Location: Powhatan School, streamside at Page Brook Run, by the bridge to the ball fields. Park in the back parking lot. Learn how to perform the collection method for the Virginia Save Our Streams Protocol. Take the opportunity to become certified as a stream monitor afterwards. Bring: boots and notes from past classes, if you have them. In-stream training demonstration and practice will come first, followed by an opportunity to take the test to be certified. For those who are unable to attend on the 9th, or need to retake the test, there will be an additional streamside training and certification opportunity in April, date TBD. Please let me know if you cannot make it on the 9th, but are still interested in becoming certified. If you attended the classroom training, please remember to bring your notes. If you did not attend, I will have ID sheets available. Please wear/bring boots or waders, as you will need to get in the stream in order to demonstrate proper collection technique. http://www.dep.wv.gov/WWE/getinvolved/sos/Documents/Benthic/AquaticInvertGuide.pdf — describes the characteristics of the various invertebrates that can be found. http://www.dep.wv.gov/WWE/getinvolved/sos/macros/Pages/Benthos.aspx — excellent set of pictures of each type of critter that you might find in the stream that you would have to identify. It includes a wide variety of Mayflies, Stoneflies and Caddisflies with their specific characteristics visible. http://www.rayswords.com/bugs/bugs.htm This is a fun site if you’d like to practice testing yourself–it’s an online test based on photos–doesn’t cover everything, but a good variety. And there are lots of keys for Identification online. If you google benthic macroinvertebrates or benthic macroinvertebrate key you could spend a long time checking them all out and find your own favorites. As a follow-up thought to our last class, you may be interested in getting a little more information about the taxonomy of the various macroinvertebrates that you will see in the stream. In the Virginia SOS protocol, there are several macros which you are not required to identify beyond the Class level. And in no case does the protocol require identification past the Order level, though there is a fascinating diversity of Mayflies, Stoneflies and Caddisflies which are the three most sensitive macros you will find. There’s a short slide show at this link which describes benthic macroinvertebrates and the “jobs” that they have in a stream. I look forward to seeing you on March 9th! The public comment period for the Implementation Plan will begin the day after the public meeting (December 6, 2012) and end on January 4, 2013. Written comments should include the name, address, and telephone number of the person submitting the comments and should be sent to Nesha McRae, Department of Conservation and Recreation, PO Box 1, Verona, VA, 24482, telephone (540) 332-9238, fax (540) 248-3069, or e-mail nesha.mcrae@dcr.virginia.gov. Please join us for a meal with friends and neighbors (free of charge) and a great opportunity to learn more about your local streams! By Edward Leonard on May 9 2012. 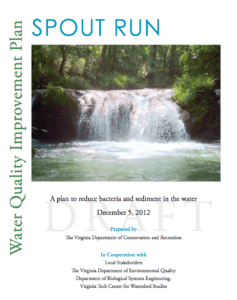 Clarke County is moving forward to begin water quality improvements in the Spout Run watershed. The Spout Run watershed covers a portion of southern Clarke County including the areas near Boyce and Millwood, Virginia. A Total Maximum Daily Load (TMDL) study approved by the U.S. Environmental Protection Agency in June, 2010 identified high levels of bacteria and sediment in the Spout Run watershed. According information presented by Virginia Department of Conservation and Recreation (DCR) representatives at an April public meeting to discuss a water quality improvement plan for Spout Run held in Boyce, portions of Spout Run and one of its tributaries, Page Brook, are on Virginia’s list of impaired or dirty” waters because they violate the state’s water quality standard for bacteria. DCR says that levels of bacteria in these stream segments could lead to increased risk of illness for people who come in contact with the streams’ waters. Bacteria sources identified include failing septic systems, direct discharges of human waste, pets and agricultural practices in the area. DCR says that in addition, a portion of Spout Run is on the dirty waters list because of its failure to support a healthy and diverse population of aquatic life. Studies have determined this is a result of excessive sediment in the stream. Sediment covers the stream bottom and destroys critical habitat for aquatic life. Sediment is transported to the stream in runoff from paved surfaces, construction sites, agricultural fields and lawns. Clarke County environmental planner Alison Teetor told the Clarke County Board of Supervisors on Monday that the study, which was completed in 2009 by Virginia’s Department of Environmental Quality (DEQ), identified sources of pollution and reductions needed to attain water quality standards. “This is a similar process to that which has recently been completed for the Chesapeake Bay Watershed,” Teetor said. Teetor explained that the TMDL study considers point sources such as residential, municipal, or industrial discharges and non-point sources such as residential, urban, or agricultural runoff. According to Teetor, DEQ computer models track bacteria from the source, to the land, to the stream, and then downstream to the Shenandoah River. Teetor said that DEQ verified that accuracy of the study by also looking at water samples collected from the stream from 1991 to 2008. As with the bacteria samples, DEQ’s sediment model was calibrated against real-world suspended sediment and flow measurements taken from the stream. Teetor said that once the Spout Run bacteria and sediment in sources were identified, DEQ’s computer models were used to determine how the level of bacteria and sediment load reduction needed to clean up Spout Run and its tributaries. Teetor said that a substantial grassroots effort has been initiated to bring funding to help with development and implementation of the Spout Run cleanup plan. Teetor said that Trout Unlimited, Lord Fairfax Soil and Water Conservation District, The Downstream Project, Piedmont Environmental Council and Friends of the Shenandoah River have agreed to help with the clean-up effort. Hobert also said that Spout Run is one of several spring creeks in the Shenandoah Valley that shows great promise for the reintroduction of brook trout. “The local watershed community is both aware of, and enthusiastic about the streams potential to support a coldwater fishery,” Hobert added. The Downstream Project president George Ohrstrom said that said that Spout Run offers a unique opportunity to visually document a stream clean-up project from start to finish. Teetor said that the cost and timeline for the clean-up effort can’t be accurately predicted but better information will become available once the project starts. “C Spout Run”…maybe you’ve see the decal? It was created by The Downstream Project to boost public awareness of a new initiative to conserve Spout Run, a tributary of the Shenandoah River in Virginia. Now The Downstream Project is partnering with the Clarke County, Virginia and many others to further broaden the reach and effect of this awareness campaign. Video: Charles Vandervoort , author of the important reference “The Status of Water Quality in the Rivers and Tributaries of the Shenandoah River Watershed” talks about local water quality issues particularly on Spout Run. Charles, a retired systems analyst, is a long time member of and volunteer monitor for the Friends of the Shenandoah River.